Black and white aerial photos from the archives of the Arizona Daily Star and Tucson Citizen show the Old Pueblo in years past. Tucson Police Officer William Shoemaker leans out of the department's "Sky Patrol" helicopter in July, 1972. The city leased two helicopters for six-months as a test. It was the first police helicopter patrol operation in Arizona. TPD said the Sky Patrol had initiated 25 arrests and assisted with 43 other arrests since the start of the program in May, 1972. The city council voted in November to continue the program and purchase two helicopters. The "shorter and wider" Broadway Road railroad under construction in Tucson, probably in early 1963. It was opened to traffic in October, 1963. Note the bypass on the Southern Pacific Railroad mainline. Also note the long wooden freight loading structure wooden water tower, long-since demolished. In 1946, the 580-acre "Rancho de la Sombra" was purchased by a group of 50 Tucsonans who wanted a second golf country club in Tucson. The photo shows the land in late 1947. It became Tucson Country Club. Tucson Country Club in 1957, 11 years after a group of 50 people purchased a ranch for Tucson's second golf country club. Clubhouse is far left. An impressive pool and shuffleball courts. The fairways are taking shape. The Benson-Nogales freeway interchange in Tucson (now known as Interstate 10-Interstate 19), completed in about 1963. Interstate 19 was completed to Nogales until 10 years alter. It was intended to replace the old Nogales Highway, then known as "Camino de la Muerte" or "Highway of Death," due to the number of fatal accidents (12 in 1967 alone). The new Interstate 19 was given a friendlier name: "Camino de los Padres." Tucson andthe Santa Catalina Mountains from 17,500-feet, looking north front about the rodeo grounds (bottom of photo) in March, 1956. It as a chillly 18-degrees at altitude. The photo was taken with infrared film and a dark red filter on the lens to pierce the cloud cover. Downtown Tucson and the barren Catalina Foothills in 1958. Interstate 10 (refered to as the "Tucson freeway" in newspapers at the time) under construction at Speedway Blvd. in the early 1960s. By Summer 1962, completed freeway sections allowed travelers to go from Prince Road to 6th Ave. The non-stop trip to Phoenix as still a few years away. Subsidence at the mine in San Manuel, ca. 1970s. An estate in Williams Edition circa 1940 owned by Sam Shifman (who started the Shifman Matress company of Newark, NJ.). He had this home built in 1936. Shifman's extended family members lived at the estate. It was demolished for construction of the Williams Center. Downtown Tucson looking east from Main Ave in the early 1960s, before any urban redevelopment projects had taken hold. The original city hall and county courthouse still stand, along with the original (and green) Presidio Park. Note the tight cluster of businesses, hotels, theatres along Congress Street, where the county building complex now stands. That dark swath at the top of the photo is the western end of the Southern Pacific RR yard (dark due to years of coal and oil residue). It's now the Aviation Parkway. Tucson Mall construction well-underway in 1981. The empty lot and mobile home sales in the lower right corner is now the site of Home Depot and dozens of other businesses. Institute of Research and Diagnostic Clinic for the Desert Sanatorium, now known as Tucson Medical Center, in 1929. It was a tuberculosis treatment center and retreat for people seeking the benefits of dry desert air and sunshine. Grant Road is in the foreground. Weather over central Tucson in 1972. Tucson Medical Center, looking north, ca. 1960s. Grant Road is in the foreground. Craycroft Road is at right. Spanish Trail winds through the center of this aerial photo of Tucson's eastside in 1970. Harrison Road is at the bottom of the photo. Tucson and downtown area looking north from 22nd Street and 6th Avenue (far right) in the mid 1960s. The La Reforma Housing Project is prominent at the bottom of the picture. It's now Drachman School and Santa Rosa Park. Tucson's original airport in 1929. In 1941, the city bowed out to make way for U.S. Army pilot training in 1941 and Davis-Monthan Air Force Base was born. The city bought land south of Valencia for what became Tucson International Airport. Downtown Tucson, looking northeast, in the 1940s. The barrio in the foreground was bulldozed to make way for the Tucson Convention Center and Symphony Hall. As aerial as you can get in 1880: Looking west at the Plaza de Armas, Congregational Church and portions of the Presidio wall in central Tucson. Tucson looking north from about 20th Street in 1929. Sixth Avenue runs through the center of the photo, with the sprawling Southern Pacific Railroad yard angling in from the right. Downtown Tucson looking southeast, probably about 1967. The freeway off ramp at St. Mary's Road (picture bottom) is gone today. But the hotel is still there. It's Hotel Tucson City Center. The Rolling Hills subdivision and golf course (left center) and Regina Cleri Seminary (building cluster in center) near 22nd Street and Pantano, Tucson, in 1970. Regina Cleri is now St. Augustine Catholic High School. Looking south on Kolb Road from 22nd Street, Tucson, in 1970. The new Palo Verde High School is at bottom right. The swatch of darkness is the Southern Pacific RR mainline and yard in Tucson, shown in this 1953 photo, looking northwest. It was the end of the steam engine age, which accounts for the coal and oil residue along the tracks. Note the roundhouse (now gone). Arroyo Chico winds its way through the lower right side. Looking east from "A" Mountain and Menlo Park along Congress St. into downtown Tucson in the mid-1970s. The Tucson Veterans Administration Hospital (now the Southern Arizona VA Health Care System) looking southwest from about Benson Highway and Park Ave. in 1954. The iconic water tower is still there. North of the Tucson city limits in 1946. It's anybody's guess where this is. We're pretty sure that's the Rillito River in the top half of the photo and Catalina Foothills beyond. A snapshot of the downtown Tucson in its original form in 1966, probably weeks away from the demolition of the first of hundreds of homes and businesses to make way for the Tucson Convention Center and city-county building complex. The new section of Interstate 10 is lower left. The Carl Hayden Community Hospital (formerly Southern Pacific RR hospital) and beautiful park (now the U.S. District Court). Tucson homes popping up in 1965. Photo is looking east from Wilmot Road (left to right) and Broadway Road. The parking lot of Park Mall is at the very bottom-center of the photo. The Pantano Wash runs through the top half of the photo. Looking north into downtown Tucson, from about 20th Street and what is now Interstate 10, in 1946. Many of the buildings no longer exist. The street that angles from left to right is South Osborne Ave. The El Paso and Southwestern RR tracks are on the right side. The barrio demolished to build the Tucson Convention Center and Symphony Hall. Main Avenue runs through the center of the photo. At lower right, the La Reforma Housing Project, which housed defense industry workers during WWII. It was demolished in 1984. It's now Drachman Elementary School and Santa Rosa Park. The completed Arizona Land Title Building (tall building at left) and completed two-story J.C. Penney Department Store on Stone Ave. in Tucson, ca. 1957. Under construction: The Southern Arizona Bank and Trust building, to the left of the Pioneer Hotel. Downtown Tucson looking south down Stone Avenue in 1956. Under construction: The Arizona Land Title building (foreground; now Pima County Transporation) and the down J.C. Penney Department Store (now Jácome Plaza in front of the main library). Downtown Tucson (at left) from "A" Mountain in January, 1953. Simpson Street is at the center of the photo, leading to Carrillo School (known for the annual Las Posadas procession), just beyond U.S. Highway 84 (now I-10). Paralleling the highway are the El Paso and Southwestern RR tracks. The El Conquistador Hotel, lower right, in 1954. It's now the site of El Con Mall. The hotel was built in 1928, but was doomed almost immediately by the stock market crash of 1929. By the 1960s it had fallen into disrepair. For a time, it shared space with the new mall. It was completely demolished in 1968. Snow covers the Santa Catalina Mountains north of Tucson, probably in February, 1966. The caption on the photo reads, "Today, the University (of Arizona) has more buildings than vacant land." That was in February, 1955. It's still true today. A bustling Stone Avenue and downtown Tucson in December, 1946. Steinfeld's Department Store (replaced by the Bank of America tower) was probably stocked for Christmas. What's still there? The Valley National Bank building (now Chase Bank), the Pioneer Hotel building, the Fox Theater (lower left) and not much else. Construction on the Interstate 10 overpass at Congress Street (looking East) underway in 1958. It was part of the first section of interstate highway in Tucson, from Congress to Speedway. It cost $1.5 million. Tucson High School on 1st Ave. and 6th St, in 1946, with the gymnasium to the south, long before expansion projects led to the sprawling campus that it is today. The Tucson Unified School District spent years buying property, including dozens of homes, surrounding the main building. By the mid 1970s, the two blocks of homes to the east of campus (right, in the photos) became the vocational building, bookstore and cafeteria and 7th Street and 1st Avenue were closed through campus. The homes south of the football stadium are gone. The land is now sports fields. Speedway Blvd. at the Pantano Wash in Tucson, 1981. Looking West towards downtown Tucson along Broadway Road just East of Euclid in 1982. The large buildings along the railroad tracks were demolished to make way for the Aviation Parkway. Looking west from Mission Road south of Drexel Road west of Tucson in March, 1953. The street running left to right in the center of the photo is Westover Ave. 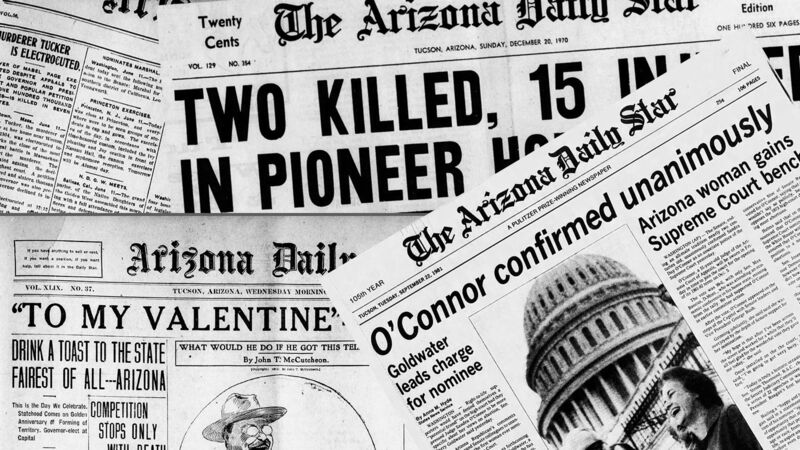 The Arizona Daily Star is available on Newspapers.com, an online home to millions of historical newspaper pages from around the United States. For comments, suggestions or questions about our archives on newspapers.com, click here.